Another easy valentine lunch for my kiddos. On Sunday I made pancakes for breakfast, and I always make extra. They make for such an easy breakfast or school lunch. And if you fill them with healthy stuff, then you can totally feel ok about giving your kids pancakes for lunch! Along with their pancakes they have whipped cream, berries, grapes, apples, and cheese. And two have a few slices of salami hiding under the cheese. Lunches are packed in Easy Lunchboxes, and the cream are in the Easy Lunchboxes mini dipper containers. Pancake hearts: I used my basic pancake recipe, but added a little extra milk to make the batter a little thinner. Then I put the batter in a condiment squeeze bottle and just squirted out heart shapes on my griddle pan. It takes a little practice, but it's really very easy. The pancakes are just stacked in paper baking cups. Maple whipped cream: I use a blender bottle to make quick homemade whipped cream. It's so easy, there's no reason to buy that stuff in a can. You just pour in your cream and shake for a minute or two. I add just a touch of maple syrup to make it a little sweet. The strawberries are just cut in half with the stem cut out in a little V, and slid onto bamboo skewers. All product links included here are affiliate links. That just means that if you choose to order something via a link I've provided, you're sharing the love by earning me a little commission from Amazon. 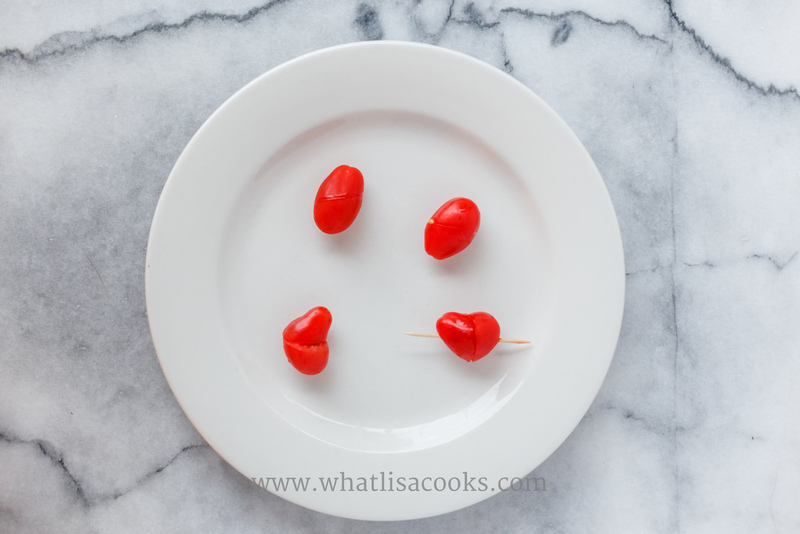 Another super easy Valentine's themed lunch for this week. I'm trying to cut back on the amount of bread that my kids are eating, so this lunch is grain free, and it is also nut free. We're not doing a totally grain free diet, but I've found that if I give them mostly just protein, fruits and veggies for lunch then they have much more energy to get through their days. So I'm trying to keep their lunches to minimal grain most days of the week, but still letting them have it a breakfast and dinner. These are all made with simple ingredients and tools that you can get at your grocery store. Quesadilla pinwheel rolls on grain free wraps. These are grain free tortilla/crepe, but you could just as easily do this with a regular tortilla - I do that all the time. Here is the grain free recipe I used. You just lay your ingredients on the tortilla (two of these have ham & cheddar, one has just cheddar), and heat it just enough to slightly melt the cheese. Then roll up, let cool and set for a few minutes, and then slice. One child has sunbutter and homemade jam instead of the cheese. Same method - spread, roll, slice. I've just placed them in some little heart shaped paper baking cups that I got at the grocery store. Apples with a heart cut out: slice off the side of two different colored apples. Use the heart cutter to cut out the center of each slice, and then put the heart back in the other color apple. The rest of the apple is cut into bites and placed in silicon cups from Ikea. I did the same thing with cucumbers and carrots - cut a good size chunk, cut the heart, and alternate it with the other vegetable. Mixed berries. The strawberries are a little bit of a heart shape by slicing in half and then trimming off the top in a bit of a V shape. The grapes are sliced in half and alternated on a stick. I was trying to do them in hearts like I did the tomatoes in yesterday's lunch, but they didn't work quite as well. These are sitting in a paper valentine muffin cup from the grocery store.